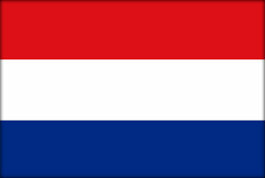 Here are some facts about the Netherlands. The Netherlands is a small country in western Europe, bordered by Belgium and Germany. Almost 20 percent of the country’s land has been reclaimed from the sea, and much of it is below sea level. The Netherlands has a population of about 17 million, but covers only about 41,000 square km. It is one of the most densely populated countries in the world. It has been described as being one of the world’s happiest countries, and has a very high standard of living. It is known for windmills, tulips, cheese, bicycles and canals. Amsterdam is the country’s capital and one of Europe’s most visited cities. It is one of the most bicycle friendly cities with almost as many bikes as residents — 1.2 million. The world’s oldest stock exchange, dating from 1602 is in Amsterdam. The city has some world famous museums, including the Van Gogh Museum with 200 paintings by Vincent van Gogh. All buildings in Amsterdam are built on poles sunk into a layer of sand up to 11 metres deep. The city’s Royal Palace is supported by almost 14,000 wooden poles. The Dutch have very strict rules covering behavior and etiquette, although the country has a reputation for tolerating differences. Most Dutch people speak at least one other language. The first tulips were imported from Turkey to the Netherlands. The country exports about 66 percent of all flowers and bulbs, and 25 percent of all the tomatoes. The Netherlands is one of the few countries in the world preparing for a rise in sea level. After flooding in 1953, work began on the Delta Project, a system of huge barriers and dams. During the 17th century, the Dutch became one of the world’s great sea powers. The Dutch East Indian Company was established, and the Netherlands had colonies all over the world.